Spray valves were improperly located over the trays allowing for water carry over to the vent. 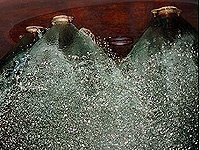 Relocate waterbox spray valves properly so the maximum distribution from a conical spray valve is obtained on the trays. Also, allow adequate distance so that water carry over is not in the vent.